Remember 10 years ago when director Michael Bay took the simply designed cartoon Transformers of the ‘80s and made them into ultra-complex, shiny beings with so many moving parts they made no sense? Well, what Bay did to the Transformers themselves is what he’s done to the fifth film in the franchise, The Last Knight. The Last Knight has so much story in it, so much useless information pummeled into every single scene, there is no room for anything else. There’s no room for nuance, no room for character development, no room for logic, emotion, or even true excitement (admittedly, Bay has never excelled at putting any of these things on camera, at least during the Transformers movies). It’s a non-stop, pedal-to-the-metal, overstuffed symphony of exposition filled with more bad moments than good. And the whole thing is executed with such a staggering over-seriousness that even when it attempts moments of levity, they almost always fall flat. Yup, they fit a dragon in there. Twice in fact. In ancient England, the wizard Merlin finds a Transformer ship and asks for their help to save his people. That discovery and subsequent bond with the Transformers changes the course of history, which unfolded with significant help from the Transformers. However, their involvement has been hidden for generations by a secret group called the Witwiccans. Meanwhile, Optimus Prime travels to his home planet of Cybertron to find his maker, the evil Quintessa, who wants to revive their planet by sucking the life from Earth. To do that, she’ll need to turn Optimus Prime into a bad guy and have him retrieve an ancient staff—the staff the Transformers gave Merlin all those centuries ago. Oh, and the staff that can only be found and wielded by Merlin’s last living relative, an Oxford professor named Viviane (Laura Haddock). So the Witwiccans are looking for Viviane to retrieve the staff at the same time as Cybertron, with Quintessa and Prime on board, is slowly descending toward Earth. Meanwhile, the remaining Autobots have to help the Witwiccans, stop Quintessa, Prime, and Cybertron, and also fight Megatron, who is helping the bad guys as well. That’s the perfect face for what you guys are in the middle of. Let’s see, did I forget anything? Actually, yes—a lot. My previous description of the basic plot doesn’t even mention the star of the movie, Cade Yeager (Mark Wahlberg), the new young heroine played by Isabela Moner, supporting roles by Anthony Hopkins (as the leader of the Witwiccans), Jerrod Carmichael (as Cade’s assistant), John Turturro (reprising his role from the first three films), Josh Duhamel (also reprising his role from the previous films, but this time as a spy), Tony Hale (as a Nasa JPL nerd), Glenn Morshower (reprising his military role), and many others. That’s also without mentioning most of the Decepticons from the previous movies, other Autobots from the previous movies, new Autobots like Hot Rod, Sqweeks, and a odd butler character named Cogman, or the new Decepticons who are introduced and removed so quickly it’s practically like they aren’t in the movie at all. There’s also a love story, father-daughter subplot, newly established anti-Transformer government agency, Dinobots, baby Dinobots, Stonehenge, mysterious horns growing out of the Earth, a mid-credits cliffhanger... the list goes on and on. Yet somehow, all of that and more is stuffed into a movie that, at two hours and 26 minutes with credits, is the second shortest Transformers movie Bay has made. Trust me, though, it does not feel like it. Isabela Moner with some baby Dinobots. Don’t worry, they play no significant role in the story. Generally I wouldn’t spend hundreds of words of a review doing a laundry list of the plot points of a movie, but that’s almost entirely what The Last Knight consists of. The remaining screentime is just left for random insanity. 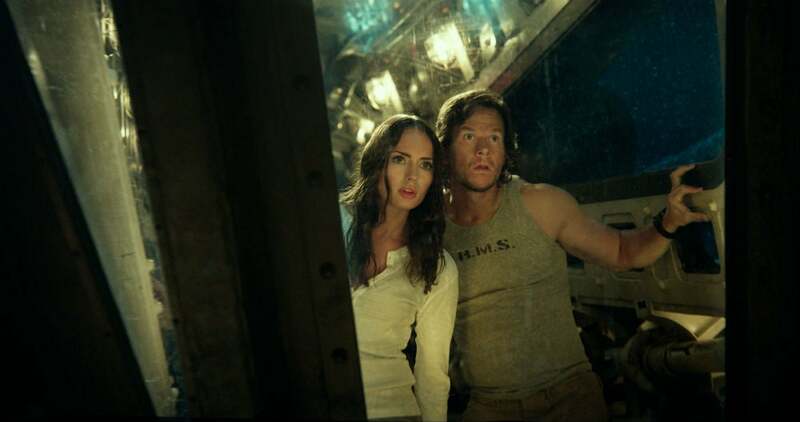 For example, at one point Cogman, who finds himself on an ancient submarine underwater with Viviane and Cade (oh right, I forgot to tell you about the submarine and underwater stuff), shoots himself out like a torpedo to catch fish so the humans can have a romantic dinner, right in the middle of a big action scene. Then there’s the anti-Transformer government agency that strikes a deal with Megatron, giving him many of his captured allies back. This might sound semi-reasonable, except that they’re introduced in a long, Suicide Squad-esque roll call with their names printed on the screen. It feels completely out of place, especially when you realise they end up being completely insignificant to the plot. As is Megatron! Award-winning actors like Turturro feel totally forced into the story and utterly superfluous. Time and space is largely disregarded as characters drive from Chicago to North Dakota in minutes and Cybertron crashes into the Moon with no consequences. Characters disappear for hours at a time. All of this opens up tons of gaping plot holes, and then there are references to the previous movies that will scramble your brain. Megatron demanding something for...something. It’s unclear. The Last Knight is just crazy. And when you think it can’t get any crazier, there’s the third act. Michael Bay’s Transformers movies have always been known for their huge final actions scenes and The Last Knight’s is the biggest one yet. 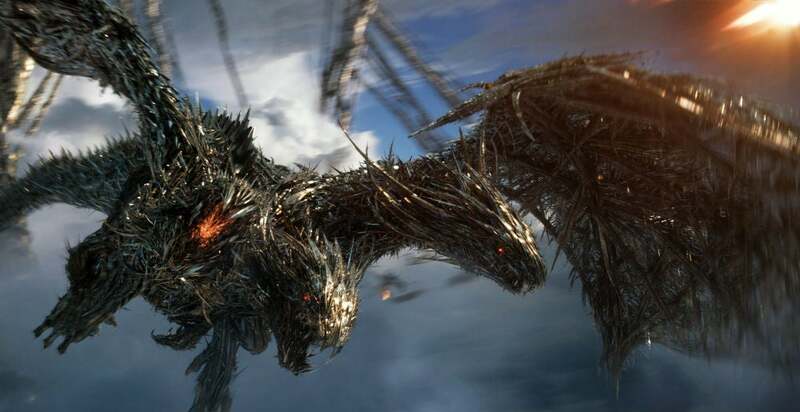 Most of the characters mentioned above come together in a scene that involves falling planets, zero-gravity, sky-diving, helicopters flying out of space ships, plenty of robot-on-robot action, a three-headed dragon, and more. After two hours of headaches trying to keep the story together, I actually found it nice to shut that part of my thought process off and just enjoy some jaw-dropping Michael Bay carnage. There are some genuinely cool moments in there. But the epic conclusion loses its gravitas because everything that proceeded it is so unconcerned with keeping us emotionally invested. Make no mistake: Transformers: The Last Knight is not a good movie. Actually, it’s more like five not good movies stuffed into one. If there’s a single good thing to say about the film, it’s that its immense ambition, scope, and final set piece are... noteworthy. If only 60-90 minutes of the “story” were cut out of the movie, giving it a focus and digestible through-line that might’ve allowed for that amazing third act to be enjoyable. Instead, the end is just the insane cherry on top of a sundae of illogical nonsense. Transformers: The Last Knight will be released in cinemas on Friday.